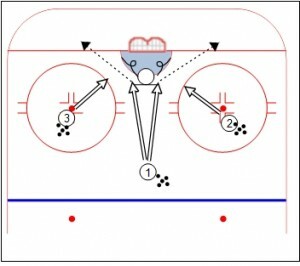 The 3 Shooter, Rebound and Recovery Drill is a great way for players to work on their shots, while goalies work on their movement! 3. Shooter 2 shoots anywhere. Goalie makes the save and stays square to the rebound, wherever it goes. 5. Goalie tries to kick rebound into the other corner, then squares up to Shooter 3. 6. Shooter 3 shoots anywhere. Goalie makes the save, then squares up to the rebound. 7. Drill repeats, with Shooter 1 alternating which side he shoots to.